Knorr® Beef Gravy delivers superior quality, balanced meat flavour, and performance you can rely on. Convenient and labour-saving, with easy prep. Less of what you don’t want, with the great flavour you do. 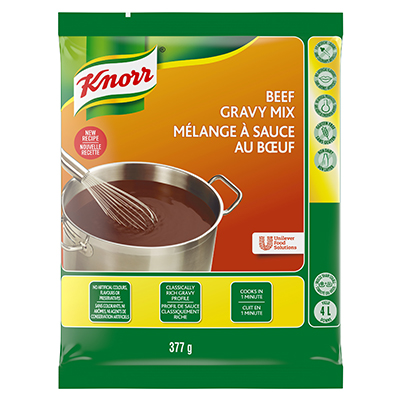 Developed specially for chefs, Knorr Beef Gravy Mix allows you to add classic flavour to your favourite dishes in just minutes. Beef stock and select seasonings combine to make a rich homestyle-tasting gravy to accompany your favourite meat, poultry, and side dish that is certain to impress your guests. The gravy comes in a dry format that is easy to prepare: simply whisk gravy mix in water, cook to 165°F (74°C) for 1 minute, and serve. 1. Gradually whisk contents of package in cold or warm water. 2. Cook in a steam table, stove top or microwave until product reaches a temperature of 165°F (74°C) for 1 minute. 3. Stir occasionally.